Napoléon Bonaparte? Voltaire? Bernard Le Bovier de Fontenelle? Claude Adrien Helvétius? Wendell Phillips? Ralph Waldo Emerson? 1) What is history but a fable agreed upon? 2) History is a set of lies agreed upon. 3) History is a set of lies that people have agreed upon. These cynical adages have been linked to several major figures including: the military and political leader Napoléon Bonaparte, the French philosopher and firebrand Voltaire (pen name of François-Marie Arouet), and the author and wit Bernard Le Bovier de Fontenelle. Would you please explore this topic? A quel dessein nous l’auroit-on donné pour faux? Quel auroit été cet amour des hommes pour des faussetés manifestes & ridicules, & pourquoi ne dureroit-il plus? Car les Fables des Grecs n’étoient pas comme nos Romans qu’on nous donne pour ce qu’ils sont, & non pas pour des Histoires; il n’y a point d’autres Histoires anciennes que les Fables. Why would they have bequeathed us a mass of falsehoods? What could this love of men for manifest and ridiculous falsehood, have been, and why did it not last longer? For the Greek fables were not like our novels, which are intended as stories and not as histories; there are no ancient histories other than these fables. Fontenelle’s comment above provided only a partial match to the saying under examination. He was referring to ancient history and not all history. Nevertheless, prominent figures such as the French philosopher Claude Adrien Helvétius and Voltaire ascribed the adage to Fontenelle. Perhaps Fontenelle wrote or spoke an expression that provided a closer match elsewhere, but QI has not yet located it. Many years later Napoléon Bonaparte used an instance of the saying, but he disclaimed credit. The transcendentalist Ralph Waldo Emerson also used an instance, but he credited Napoléon. The well-known orator Wendell Phillips employed a version with the word “lies” in 1881. Detailed illustrations for these assertions are given in the chronological citations below. 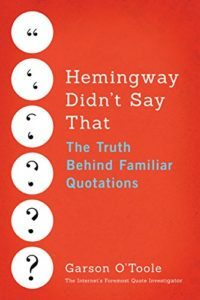 QI thanks previous researchers on this topic including Fred R. Shapiro, editor of “The Yale Book of Quotations”, Professor William C. Waterhouse, and Barry Popik. Continue reading What Is History But a Fable Agreed Upon?